Walsh Design Group is delighted that construction is now underway for the Phase 2 development at Earls Well in Waterfall, Co. Cork. 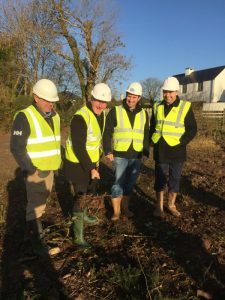 The sod-turning marks the commencement on site of 12 large detached houses. The photo below shows Mike Walsh, Walsh Design Group; George Maloney, RSM Ireland; Norman Fleming, Blue Broe Ltd. and Keith Screeney, Townmore Construction Ltd.